Ellie Claire is proud to partner with Hatch Show Print, a Nashville icon since the 1800s, to create two fresh, specialty art journals. With an art paper feel and letterpress look, these journals are nostalgic and contemporary at the same time. The titles from familiar, beloved songs make these journals irresistible. Hatch Show Print, founded in 1879, thrives as a working letterpress poster and design shop, creating artwork for bands, events, and political posters using the same printing methods as they have for more than a century. 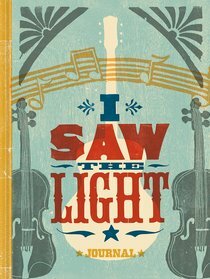 About "Signature Journal: I Saw the Light"